HARARE, Zimbabwe (CNN) -- A senior World Bank official announced Monday that Zimbabwe will get a $22 million grant to help the country's battered economy. 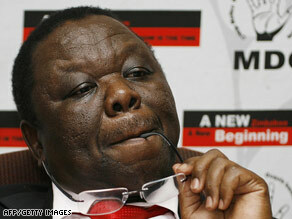 Prime Minister Morgan Tsvangirai has requested financial help from governments and international institutions. Toga Gayewea McIntosh, the World Bank's executive director for the region that includes Zimbabwe, made the announcement in Harare after meeting with Prime Minister Morgan Tsvangirai and Finance Minister Tendai Biti. McIntosh did not give a specific date for Zimbabwe to get the money, but said it would be in the next "few weeks." Beyond the grant, McIntosh said Zimbabwe could possibly get loans from the World Bank if it clears the more than $1 billion that Zimbabwe owes international financial institutions in debts that have been accruing since 2000. "The first task is to see how Zimbabwe can get on with debt reduction," McIntosh said. Zimbabwe is facing a major economic and humanitarian crisis. Since the formation of a coalition government in February, the cash-strapped country has sought more than $8 billion from international sources to rescue an economy that has been in recession for almost a decade now. Meanwhile, the German government Monday announced a 10-million-euro ($13.5 million) financial package for Zimbabwe to help the new government. Ingolf Dietrich of Germany's Federal Ministry of Economic Cooperation and Development said half the money would be earmarked for water purification efforts to avert another cholera epidemic. More than 4,000 people in Zimbabwe have died from cholera in the past year. "Prime Minister Morgan Tsvangirai wrote to our government requesting for support in water purification," Dietrich said. "It is also important to have agricultural support for the next season. We want to give a support program for fertilizers and seed for the next harvest. There will be more cooperation with Germany depending on political development in the country."